Rob Vitas could be in action for Ketton at Hampton. Hampton won Division Seven last year, but have entered two teams in the competition this summer. They have a second team in Division Six, which is the bottom Rutland League division this year. Lincs-based side Seas End Hall have pulled out of the competition after being placed in Division Three leaving that section with just nine teams. Some of the ‘bigger’ local clubs are in friendly action this weekend, but both of Peterborough Town’s scheduled matches have now been cancelled. Town’s Northants Premier Division programme doesn’t start until April 23, the same date as the Cambs League begins. The Lincs Premier Division involving Bourne and Market Deeping starts on Saturday, April 16. 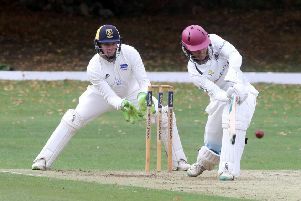 Friendlies: Boston v Spalding, Caythorpe v Peterborough Town, Hampton v Ketton Lions, March Town v Long Sutton, Nassington v Stamford Town, Frinton v Ramsey, Stamford School v Burghley Park, Stamford School 2nds v Burghley Park 2nds. Rutland Division Four: Hampton v Isham. Friendlies: March Town v Downham, Spalding v Ketton, Bourne v Lincoln. A three-page preview of the 2016 season will appear in the Peterborough Telegraph next Thursday (April 14).